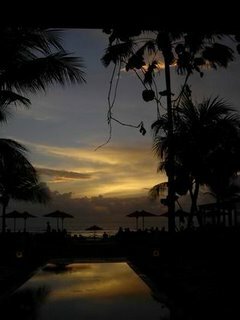 I think Ku De Ta is the coolest place to chill out in Bali. The place is fancy and elegant, with a well-decorated indoor restaurant and a comfy yet romantic ambience outdoor (not to mention the touch of palm trees, in which for non-tropical people they found them exotic!). 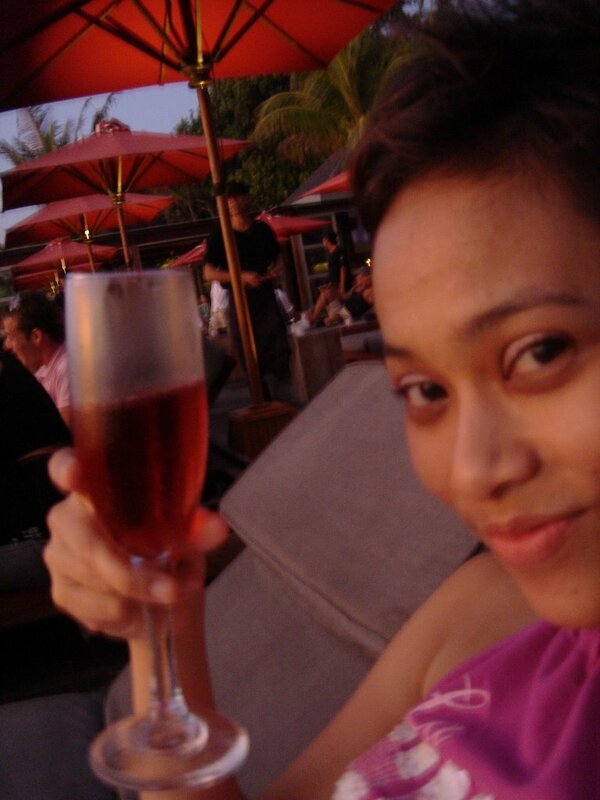 One can chill and lay down on a reclining sofa under a big umbrella, facing to the beach while enjoying a glass of champagne, wine or cocktail. Perfect! So relaxing… I love it, even though I couldn’t see the sunset clearly as it was a clowdy afternoon, but hey… I had nothing to complain. The scenery was just too breath-taking and the relaxing vibes made me even more satisfied and felt content 🙂 Dinner at The Living Room was another experience. I’ve never been to this place before and I felt glad that I went there. The Living Room has the prettiest garden a restaurant could have. I was in love with the garden by the time I stepped my feet on it. It’s a perfect garden for holding a small yet elegant wedding reception! Hahaha.. 😀 Seriously. It was just like in a Hollywood movies. One can sit at the outdoor area – in the garden, with candles all over the place – and at the indoor area, where the setting is just like in the living room of a big house. Nice. The restaurant offers Italian food. Unfortunately, my food didn’t taste that delicious. Too normal. Perhaps it was because I ordered a stir-fry veggies. I should’ve ordered a more authentic Italian food, such as.. uhmm.. veggie lasagna? Who knows it tastes a lot better… (I just hope that the food is as nice as the garden. If it’s not.. then, too bad!!! )Liquid, Spy Bar, Fuel and Kama Sutra were all empty that night! I was wondering why… It was very odd for me coz normally those bars were always full of people. 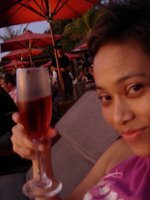 So, no bar hopping tonight, yahhh… Second Day in The Island of Gods… Fri.18.Nov.05Embracing the morning breeze in Kuta Beach definitely made yourself ease, happy and relax. 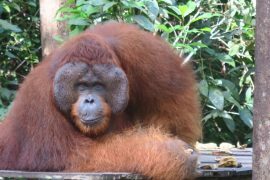 Danny swam happily on the beach before laying under the sun, tried to get some tanned. Huekekek… couldn’t beat me, huh?! :p Kuta Beach was the same when we’re talking about those locals who tried to sell their stuffs and offered you some services, such as manicure, pedicure, massage and tattoo. One has to be very patient in handling them. I got a manicure, pedicure and massage. Always love the flowers painted on my nails as they look so cute! Have tried to do it by myself at home, last year, but… it didn’t work. Guess it wasn’t my area of expertise… huekekekek :pOn the second day, we managed to take a trip to Pura Taman Ayun and Tanah Lot. Luckily, on the way to Taman Ayun, there was a woman selling durian on the street! OMIGOD!! The answer of my prayer! Hahhaa.. I’ve been imagining eating durian in Bali since the first day here! The durians were not so big in terms of size, but the price was cheap, tho. It was only Rp 6,000 to Rp 7,000 each! Wow. 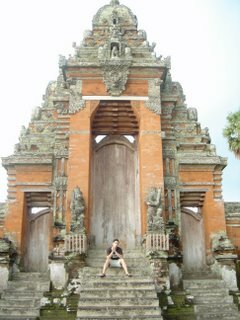 I was happy ;D Pura Taman Ayun located in Mengwi and was the area of royal temple which was built in 1634. A lake surrounded the temple reminds us of a castle in a fairy tale. Unfortunately, the inner side of the temple was closed for public. So, one couldn’t see what’s in it. One could only walk around the temple and take a peep from a big wall – one meter high – covering the inner temple. It was raining when we got there, so we didn’t explore it that much. 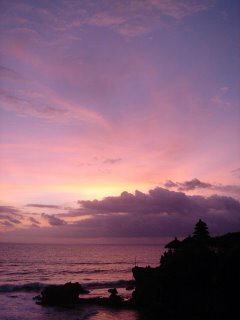 Just took a quick look and headed back to the car, continued our trip to the next destination: Tanah Lot, before the sun went down.Tanah Lot is one of main tourist adestination in Bali. The temple was built in the 16th century by a priest from Majapahit. It is special because the temple is built on top of a huge rock which surrounded by the sea. It is a fantastic place to view beautiful sunsets. No doubt, seeing the sillhouette of the temple with a glowing sunset as the background is just amazing. Very lovely. Every day at dusk a lot of tourists come to witness the magnificent scenery. The best view is from the cliff overlooking the temple, where the locals built some outdoor cafes. Clubbing time! 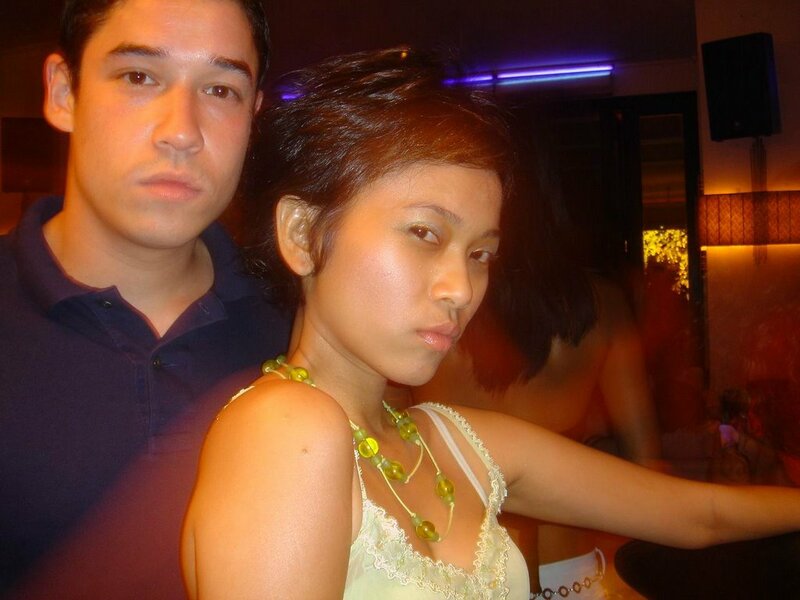 One has to check out the clubs in Bali, especially in the weekend! It was Friday night, a perfect time for clubbing ;). I took Danny to De Ja Vu, a fancy bar and a cool hang-out place in town. The bar has a special drink, called “Sudden Death”. If you happen to be in this bar, u should order this drink. It contains of more than 20 kinds of alcohols, served in one glass ;D. It has peppermint taste, so when u drink it, just imagine that you’re drinking a cough syrup. Hihihi.. I guarantee, by drinking only one glass, you’ll be in a ‘different level’ right away. :DNext destination was Double Six. A lot of big parties are being held here. It’s a must go club in Bali. For those who’s an adrenalin junkie, u could try the bungy-jumping here as well. If u don’t have the guts to do it, just take a few tequilla shots before u jumped! 😀 *just an idea, though* Unfortunately, when we were there, the club was soooo empty. I’ve never seen 66 that empty before! There were only 7 people including us! Unbelievable. Had no idea what’s happening… but we decided to go to the next lounge, Paparazzi. Paparazzi was also quiet, but it didn’t matter that much since I was already tired anyway. One could sit on the sofa at the terrace facing the beach. Just a perfect place to end the day… Last Day… “Feels like in Paradise”Sat.19.Nov.05Had “nasi pecel” as my brunch on the Kuta Beach. Surprisingly, the food was good :). 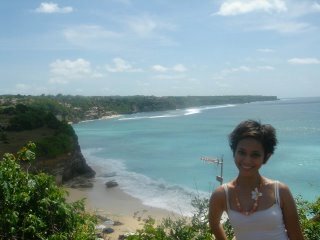 Then, to end our holiday in Bali, we decided to go to Dreamland Beach. 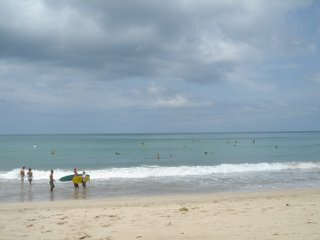 It took about 40 minutes from Kuta to Dreamland by car. The weather was so nice, the sun was shining so bright that day. A perfect day to go to a beach. Everytime I went to Dreamland, I always amazed with its beauty. “Wow. It feels like in Paradise”. That was Danny’s comment as soon as we arrived there. Yeah… it did feel like in Paradise, with a beautiful beach in front of us, white sands, big waves, completed with nice cliffs at the right and left side of the beach. So beautiful. Full stop. We spent about 3 hours on the beach. I managed to have massage for an hour… tried to spoil myself at the most during my holiday. Hehehe.. Dantje tried so hard to be tanned. And I think it worked, though! 🙂 Great! It would be better if he spent for another 2 weeks in Bali, though. Am sure he would be as tanned as those latino guys. Huekeke.. (he’d love it, definitely!). W italy!! 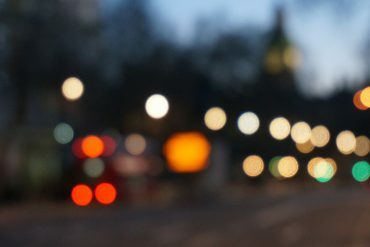 !it’s beatiful your blog!! !hi!